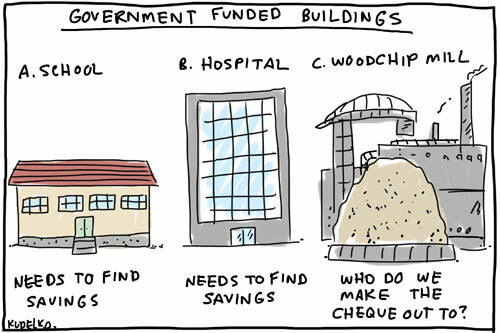 The government barn is apparently so light on for hay that it’s ripping fodder out of the schools and hospitals which it is nominally responsible for. You’d think under the circumstances it would be reasonable to tell a private venture like a woodchip mill to find itself a private paddock rather thanÂ pitchforking precious taxpayers’ hay to the forestry industry until the cows come home. Shhhh, That is the question which must never be asked of a Government. Or you will be called a trouble-maker and Governments never listen to troublemakers. Sticking with the barn analogy, I reckon on the trouble-maker front there’s no horse in the stable either. Just makes you shake your head in disbelief! We imagined it didn’t we?